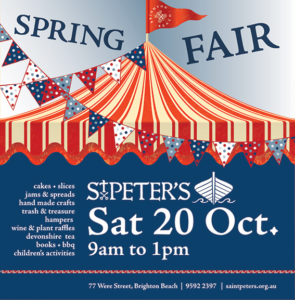 Please join us on Saturday 20th October for the St Peter’s Spring Fair at the Kindergarten, for food, crafts, children’s activities and more. We are looking for parents to volunteer for the kinder stall in 1 hour slots from 8.30am – 1.30pm. A sign up form is on the bench near the sign in books. We also are taking donations for our ‘New & Pre Loved’ Toy Stall and anything can be left on the bench at kinder.